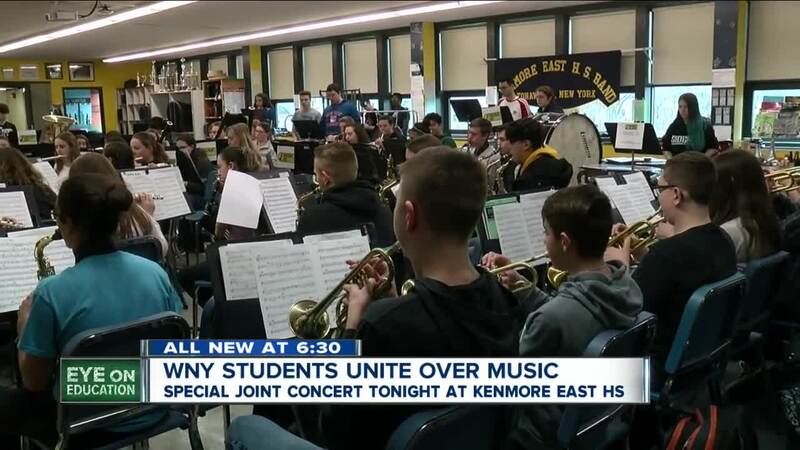 TONAWANDA, N.Y. (WKBW) — The importance of music education, especially for inner-city school students, is the focus of a special concert Monday night at Kenmore East High School in Tonawanda. 7 Eyewitness News senior reporter Eileen Buckley attended a rehearsal to learn about this suburban-city school collaboration. Kenmore East band director Phil Aguglia wears a Mickey Mouse hat as he conducts students. Aguglia is a product of Buffalo Public Schools and a graduate of Hutch Tech. But the 27-year veteran music teacher worries about city students who might not have the full advantage of music education, so he created a unique concert collaboration - 'A Celebration of Harmony in our Community'. It will feature bands from Hutch Tech, Buffalo Performing Arts and Cheektowaga Central High School for a unified performance. “It’s awesome – build that bridge – you know we’re all the same – kids are the same – they all eat and breathe the same stuff. It’s chicken fingers and pizza all day long – why can’t we make music together and to me this has always been a passion,” Aguglia declared. Student band members are also collaborating with Music is Art by finishing the phrase 'Music is...' and sharing it in classrooms and on-line. Kenmore East senior Mckinley Falkowski plays bass. "There is an extremely important aspect of music that - it's not just with playing an instrument it's the social network that it creates - it's the emotional aspect that it enhances,” explained Falkowski. Senior Rachel Hamilton plays the flute. “I find that it's a really good creative outlet - especially senior year - academics are getting really stressful - all exams are coming up - but playing an instrument is just something fun - it's relaxing - but i can also put hard work into it,” remarked Hamilton. Music education supplies brain power for students. Students and experts say it generates several benefits including improved academics, keeping students in engaged in school and helping a students’ emotional well-being. Monday night’s invitational concert will feature guest speaker Dr. Robert Mazurkiewicz of Aurora Natural Health, who is an expert on the effects music has on the brain. He will work with students earlier in the day and then appear at the concert for an audience conversation. The concert will feature nationally known conductor, Dr. Jeffery Gershman, Capital University Director of Bands and Dr. Randall Bayne, from scholarshipauditions.com. His organization says in 2018 there was more than $5-billion, yes-- billion, available in arts and music scholarships nationwide for students.